Discussion in 'Grappling Technique' started by ozyabbas, Apr 24, 2008. I believe that some people don't want to compete in SENI because its the main big one and haven't had the opportunity to train at smaller events to get experience in competing in bjj comps. Some people just get too nervous to compete, experience should hopefully take the edge of some of those nerves. One of the answers to this dilema is to just have more comps in various parts of the country. Advice from other countries or martial art disciplines (mainly grappling ones) that have overcome or at least partially overcome this problem. Some of these ideas may sound retarded, I haven't really had time to think them through and they probably are retarded ideas. 1) Competitions that pit different teams against each other. This could be a very small scale thing because there aren't really that many teams. 2) Have a country against country thing such as Brazil against Japan or the UK against France. 3) Different grappling schools compete against each other, ie perhaps some judo against bjj. Hopefully this won't result in an unfriendly atmosphere but creates an incentive for more people to crosstrain. Judo schools organise competitions frequently so advice from judo schools would very much appreciated. 4) The urban gorilla tournament to happen more frequently and for it to move from area to area rather than just the north. 5) If/When there are enough clubs to do a regional event then perhaps that could be organised. One thing I would really hope for all these competitions is that it is kept at a more novice, intermediate level with a FRIENDLY atmosphere and not rivarlry mixed with grudges. Hopefully it will bring more bjj guys into judo and vice versa. There are far more judokas than bjj guys so it could possibly increase the size and awareness of bjj in the UK. These interclub tournaments don't have to be large at all, if someone has a reasonably sized gym then it can happen there. Hopefully this will result in decreased costs in setting up these competitions. Hmhhh... I was under the impression that there are quite a few tournaments in the UK compared to other Euopean countries. As mentioned in the other thread, Braulio will be hosting tournaments at GB Brimingham in the near future. It's a nice central location too. I have heard of a tournament in Kent (from another poster). The ones held by Braulio in Birmingham. The urban gorilla in Sheffield (not sure about that one). The seni (what does that stand for) in London. The ADCC trials in London. I think Marc Waldar set one up in Ilford but I can't remember the details. I just believe the more tournaments, the better it is. Not only the number of tournaments but also the type of tournaments. Another poster mentioned collecting points for each tournament entered, it sounds like an interesting idea but im not sure how it would be implemented. It just seems to me that judokas and bjj guys in the US have many tournaments they can enter throughout the year in most parts of the country. I believe its part of the foundation of why judo is so great and perhaps why American bjj is growing very fast. The only negative side I can see is that it might put off the kind of people that just like to do it as a hobby and to relax them. Rather than doing more physical tournament training. EFN run 3 gi competitions (Gracie Invitational @ Seni, Northern Open and Southern Open) each year as well as a couple of no gi comps (3 planned for this year) so a competiton on average every two months from them is pretty good. Off the top of my head other competitions include Cleveland costal (gi) confirmed for 22ndJune, North of England Grappling Championships 2008 (no gi) are in Sunderland on the 25th May ,there was the Welsh open last month, the Bristol Open winter leg was not too long ago (they ran a summer leg as well last year so would expect a repeat), Scottish Sub League, there was the first I Caledonia BJJ Open last year and would expect a repeat this year, UMA UK and The combat academy. I am pretty sure will be doing a Essex open again, although no details yet, and I would imagine the Northern open would be in Birmingham again rather than Sheffield (although hopefully not as it less distance to travel ) The Calander is fairly busy and you could easily fight at least once a month if not more, especailly if you do gi and no gi. I think the events aren't always advertised on here though, efnsports.com is probably the best place to keep an eye on UK events. 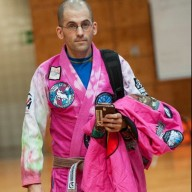 Is the ADCC in June for top level no-gi guys or do they have different experience levels? It just seems to me that judokas and bjj guys in the US have many tournaments they can enter throughout the year in most parts of the country. That's probably also partly to do with the big amateur wrestling scene in the US, meaning that AFAIK there are lots of ready-made facilities for BJJ tournaments (especially universities, as they'll have a big hall with decent seating and a load of wrestling mats). In the UK, not quite so readily available. Jude talks about the difficulties of setting up comps in the UK, along with a load of other stuff on the UK and European scene in general, during his Fightworks Podcast interview from back in 2006. This is possibly the first or at least one of the first threads I ever made. I wish I was still in the same shape I was when having first started this thread. Some good info on this thread, thanks!! You could just host an in-house tournament if you have enough space, call up the instructors of nearby schools and invite them, and have a little thing like that, if you're looking for small tourneys to get guys experience. One thing I would really hope for all these competitions is that it is kept at a more novice, intermediate level with a FRIENDLY atmosphere and not rivarlry mixed with grudges. Hopefully it will bring more bjj guys into judo and vice versa. Something we do out in Cali is we guarentee 3 matchs (4 min each). Also its a tap early tap often format, meaning you grapple the entire 4 minutes regardless of if you get tapped in the first 30 sec! You tap, you both get up, slap hands and go again. This ensures that the novice grapplers get there monies worth and it makes the whole event less stressfull! People dig this out here. Who wants to pay $60 bucks and only get one or two quick matches? it also helps in the friendly atmosphere and comraderie. Then at the end of the tourny they have an open weight tourny that is legit with score and time and winners and losers....this is for the guys who want to test themselves after a full day of full filling grappling. Just some ideas. Also, its not a big cost thing at all. Actually its a way for gyms to make some money. As long as you have room for say 4-6 matches then you are good. You invite all the students close by gyms and charge them a small fee. Alot of volunteers from the competing gyms staff and you are good to go.